Condition : Sturdy stool with no structural issues. As shown in photos, black paint is chipped in areas, revealing green paint beneath. This is a used item and may have imperfections due to normal usage. 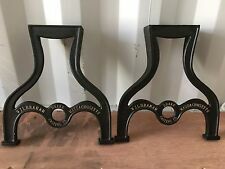 Antique Art Deco Cast Iron Legs Only from a Verona 537 Pat Pend Bench. 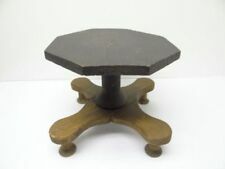 This decorative base and legs only measures 15.75 X 19 X 8 inches and the seat support arm from top of leg to where it would attach to the seat is 7 inches. The legs have limbs, with a flower and leaves design that still retains some of the original color. There is a 19 inch twisted iron bar attached between the legs for support. It will take 8 round head screws to attach to a new seat board and then a seat cushion. The cast iron legs exhibit minor surface rust, but I don't want to disturb the original paint by cleaning. This footstool is not a reproduction. replaced with foam rubber. The needlepoint is original and in very good condition. The finish is perfect, the wood is solid walnut. Height is 8 1/4 from the floor to the top of the cushion. THERE IS FADING OF MATERIAL. Antique Victorian Burgundy Velvet Turned Wood Footstool Ornate Scrolled Wood Legs- Sides with Nailhead Trim. 12” long. 7.5” wide. 7” tall. Vintage Milking Stool Foot Stool Floral Design Footstool. Shipped with USPS Priority Mail. This stool is made of mahogany wood, Twisted legs with a very nice original needlepoint. These stools do swivel but they only swivel 90 degrees to the left and 90 degrees to the right they do NOT swivel 360 degrees. As with anything used, there may be imperfections. Gently used piano chair for sale. This was my grandmother's and was used with a Steinway piano. It has a yellow felt cushion. The chair is sturdy and is in good shape. Local pick-up available in Atlanta. Bench Vanity Stool. Excellent condition. Condition - great, see photos. Very sturdy wrought iron. No stains or wear to the seat. Classic Umanoff stool from the Grenada Collection. 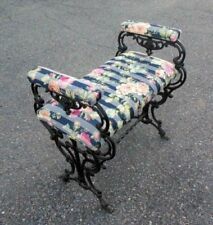 Great wrought iron designs at seat back and repeated on legs. 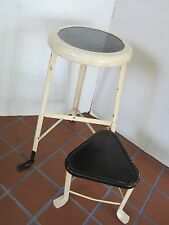 Stool is heavy and sturdy and swivels easily and smoothly. Great MCM Umanoff stool will add modern style and charm to any space with most any décor! Milking Stool with Cushion and seat back. Very reminiscent of Hitchcock design, but could possibly be Nichols & Stone. Black Harvest Hand Painted Stenciling. Recently recovered in 4" white faux lamb upholstery fabric. Fur fabric is synthetic poly. Caned seat back is perfect having no flaws. The chair is solid hardwood and heavy for it's size. There is no paint loss. Its condition is good and consistent with age. We do our best to correctly represent the condition and color of each item in the photos but keep in mind monitor screen colors can differ. Its in very good sturdy condition. It have few scratches and wear marks as shown in the pictures. Any imperfections that have occurred only add to the charm and uniqueness. I will find the most reasonable cost to your location and search for the best Quote. Any imperfections that have occurred only add to the charm and uniqueness. Original black vinyl upholstery. Mid century modern designer seating by Frederick Weinberg. Classic design. Rare and versatile bench. Has original label underneath. In very good condition. Size- 64w x 21d x 25h, seat 19" from floor. Rotating Mid-century Western Style whiskey Barrel bar counter stool rotating. Primitive -Wood part is Oak and appears to have been hand made. EACHPHOTO IS WORTH A THOUSAND WORDS AND THEY ARE OF THE EXACT ITEM YOU WILL RECEIVE. RARE THREE ANTIQUE BENCH LEGS, VERY COLLECTABLE, THREE HEAVY DUTY BOLTED DOWN BENCH LEGS, THE BENCH HAD WHITE OAK WOOD SLATS ON IT,72" LONG. EACH, AND WILL NEED TO BE BOLTED DOWN WHEN FINISHED, BECAUSE IT SHOULD WEIGH OVER 100LBS. 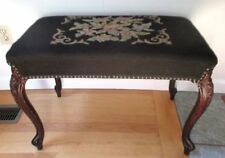 This wrought iron bench with a padded velvet cushion dates from around the late 1800's to the early 1900's. The steel has been bent, rolled, twisted and forged to form this very attractive bench. It is bolted and riveted for a solid construction. In very nice condition. What you see is what you are buying. Antique, twisted iron, shoe shine stool. Floor to seat is 16". 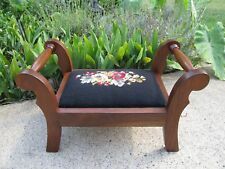 45305EC: Regency Style Cane Seat & Sides Black Window Bench. Custom Upholstered Cushion. Our newest location, Stenella Interiors is a 24,000 sq ft, beautifully arranged showroom located in Lansdale Pennsylvania. Vintage Pair Upholstered Tufted Ming Base Hollywood Regency Ottomans REDO's! These Ottomans I would consider Re Do's because the fabric is very faded from years in a very Light Exposed Entry Foyer. Otherwise very structurally sound and most likely gently used. Sorry to be so blunt. The gentle curve of the arms and recessed panels add to its allure. The bench has recently been painted black and lightly scraped to show the natural pine underneath. The bench is sturdy and ready for use. Vintage Victorian Style Solid Wood Footstool Ottoman with Wool Cushion. Shipped with UPS Ground. (Chippendale Style. Tufted Plaid Upholstery. Our newest location, Stenella Interiors is a 24,000 sq ft, beautifully arranged showroom located in Lansdale Pennsylvania. L45647:) will be on display at our Lansdale location. Mid Century Modern bench by Milo Baughman for Thayer Coggin. New matte black industrial vinyl similar to original. Perfect for extra seating or a bench at the end of the bed. You will have to pick it up at the station nearest you. Photo number 6 shows the area of most wear. This is still a spectacular find and a beautiful piece of woodworkers art and skilled needlework combined. The stool is 7 1/2" high. Missing foot glides. Normal paint loss. Overall very nice.